Presiding over a small China closet in one of the corner rooms in Duff House, is a rather unassuming painting, but one which tells a rich story. The theme for the Study Days at Duff House this year is Portraiture, so we took a walk through the House to look at our favourite portraits on display. One in particular caught our eye. Portrait of Magdalene Erskine at Duff House. Peering out of the gilded oval frame is an elderly lady – the inscription tells us that this is Magdalene Sharpe Erskine. 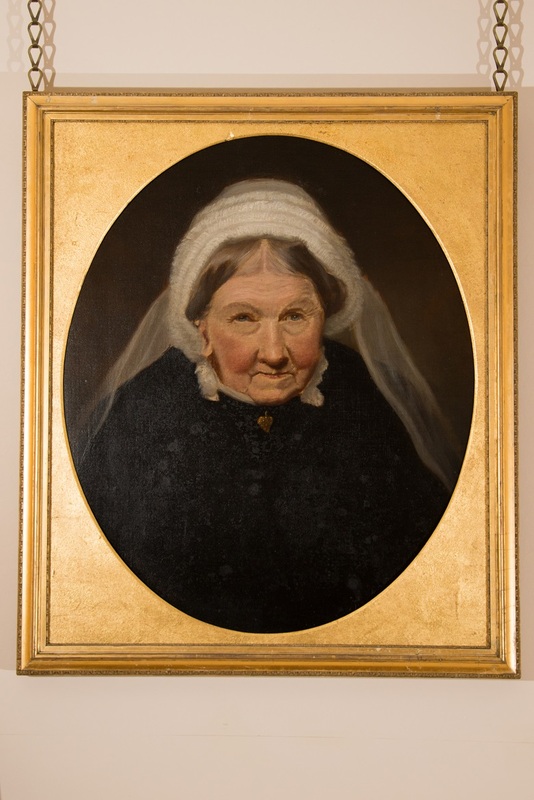 This painting shows her later in life, perhaps in her 70s or 80s. She kept her ex-husband’s name ‘Sharpe Erskine’ until her death. The dark tones of her dress are offset against the luminous gold of the frame. 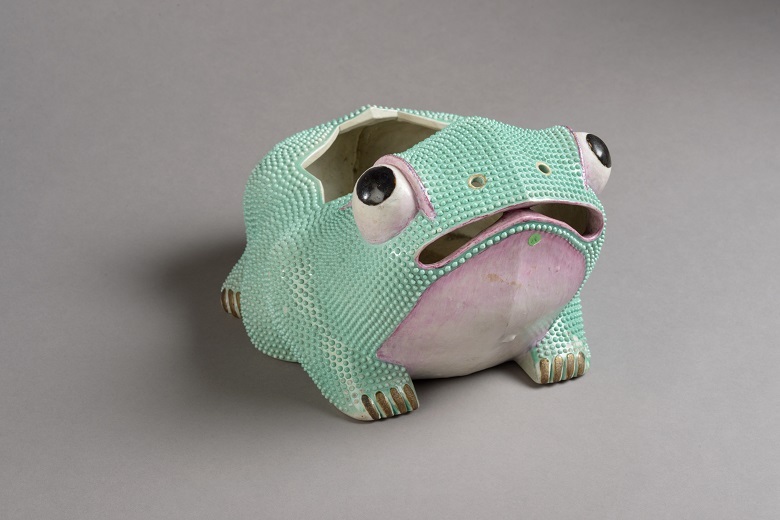 The attention rests solely on the face and its expressive features. There is a twinkle in her eyes and a hint of a wry smile. Her expression in this image has previously been described as ‘distinctly shrewd’. We know we are face to face with a confident woman. Did the small heart-shaped necklace catch your eye? It can be seen gleaming faintly against the black dress. Maybe it was a present of devotion from the short-lived marriage? 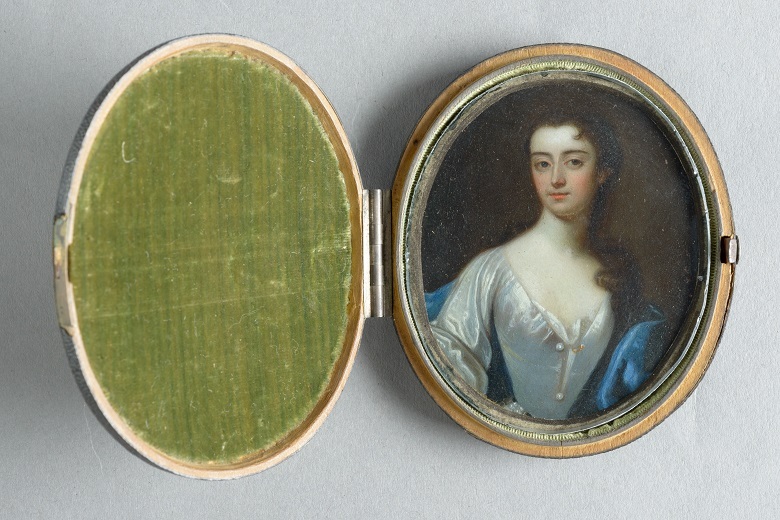 As more research is carried out into the collections at Duff House, Magdalene becomes more and more intriguing. The Erskine family collections were brought together throughout the 18th and 19th century by two generations of Erskine family members. And it was Magdalene who kept the wonderful collection of fascinating objects, paintings and library books together. In particular, Magdalene was a lover of ceramics and glass. Many such items are displayed alongside her portrait in the China closet. They range from the day-to-day to totally eccentric. 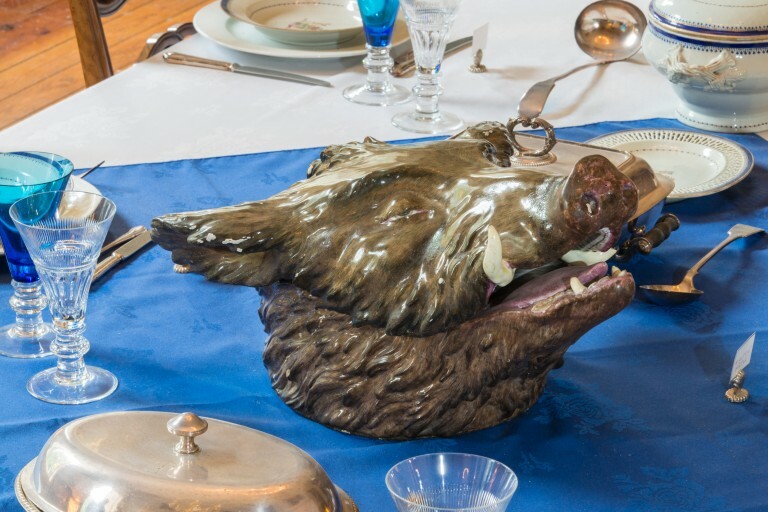 A boar-shaped tureen and a frog-shaped flower holder are two of our favourite objects in the house! The Erskine family collections used to be housed in the grand setting of Dunimarle Castle near Culross, which Magdalene Sharpe-Erskine bought in 1835 for £5,000. The collection was displayed there for more than a century before moving to Duff House. It can now be seen on display in almost every room. It is thanks to this generous loan that the character of the House can be recreated (the original Duff family’s collections have been dispersed). Although the furniture and paintings are not directly related to the Duff family, it seems the Duffs and Erskines shared many interests. So, thanks to Magdalene, visitors can get a good idea of the Duff family’s tastes and their activities at the time. Magdalene’s is not the only member of the Erskine family that can be found throughout Duff House. 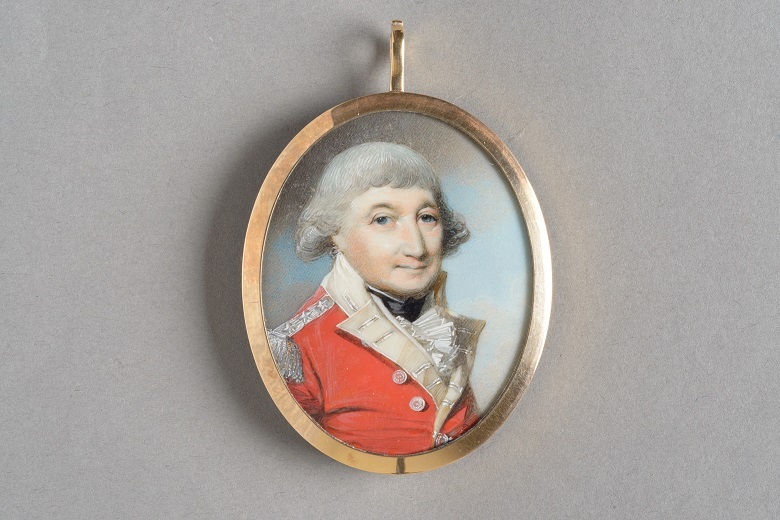 Miniature portraits displayed in the cabinet depict her father Sir William Erskine (above) and her grandmother Henrietta Baillie (below). Magdalene’s whole family, including her three older brothers and three older sisters, feature in David Allan’s portrait of ‘Sir William Erskine of Torrie and His Family’. Magdalene’s portrait was painted in 1887, fifteen years after her death, and was probably painted from a photograph. It appears to reference the composition of other Erskine Family portraits, most closely that of her grandmother and one of her sisters, Henrietta. A melancholic note to end on is the juxtaposition of Magdalene’s appearance in her portrait and in David Allan’s painting. One shows her as a young child and the other as an old lady. Her face bears all the marks of age, but also the remains of beauty. What a life in between! Magdalene was the last Erskine of Torrie. 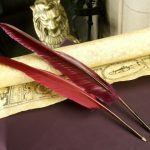 With her death the family line became extinct. This may have been why she founded the Erskine of Torrie Institution for the promotion of the Study of the Fine Arts at Dunimarle Castle. Today, the name of her family is kept in perpetual memory at Duff House. 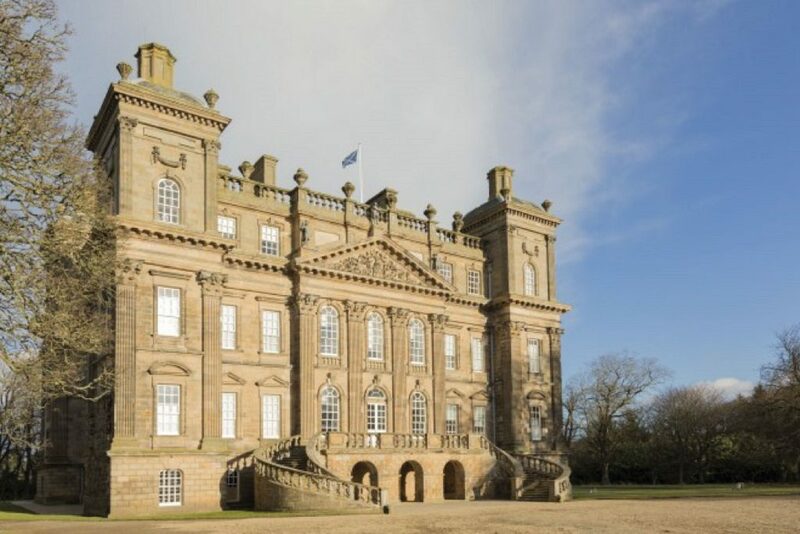 Join six experts at Duff House on the 27th or 28th of November to learn more about these unique collections! Tickets need to be booked in advance.